I have been asked to crochet a recycled plastic soap dish holder so this is up I came up with. 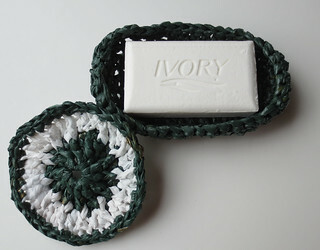 I crocheted this soap dish using about three recycled plastic bags so it’s a great project if you only have a few bags in a special color. It’s just the right size if you have a large square bar of soap. 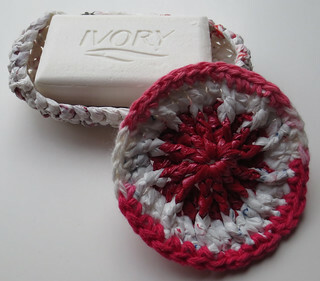 Here is my plarn soap dish with a scrubbie also crocheted from recycled plastic bags. 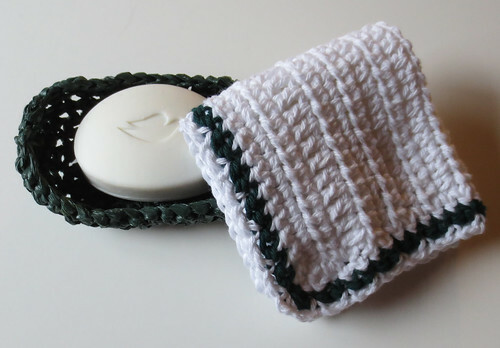 Here is a plarn soap dish pictured with a oval bar of soap along with a crocheted dishcloth to match. Here is one other crocheted soap dish with white plastic retail bags along with a scrubbie added with a cotton yarn trim. The cotton yarn edging adds a colorful touch to the otherwise boring white bags. 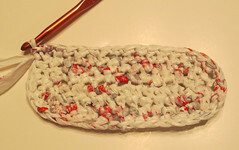 You can also use the soap dish crocheted from recycled plastic bags as a scrubbie holder. Just rinse it out in warm water if it gets too soapy or dirty. 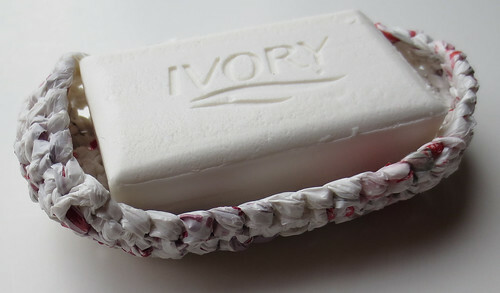 Either way this recycled soap dish is a handy holder and provides a useful way to reuse those plastic bags you may have stuffed in your kitchen drawers and cabinets. Ch 13, Sc in the 2nd st from the hook and in each st across. Then turn and work Sc down the other side of chain in each st. ( 24 sts) Don’t join but work in the round until advised otherwise. Sc in each st around. Ch 1, Sc in BLO in ea st. Join with Sl St to Ch-1 beg. Ch 1, working in both loops now, Sc in each st around. Join with Sl St to Ch-1. FO. As a soap fan and designer for washbasins I love this dish so much. Great blog by the way. How long will the object last. Everything in my bathroom turns to crud, I’m thinking pastic could help solve the problem. I’ll give it a try!